The seventeen year career of D7591/25241 started with four years on the LMR followed by thirteen years on the Scottish Region. August 1968 to Eastfield (65A). October 1968 to Haymarket (64B). 25241 was the 99th Class 25 to be withdrawn, one of eight retired during May 1981. After withdrawal 25241 was stored at Polmadie before being sent to Swindon Works, arriving there by July 6th 1981 scrapped by the second week of September 1981. 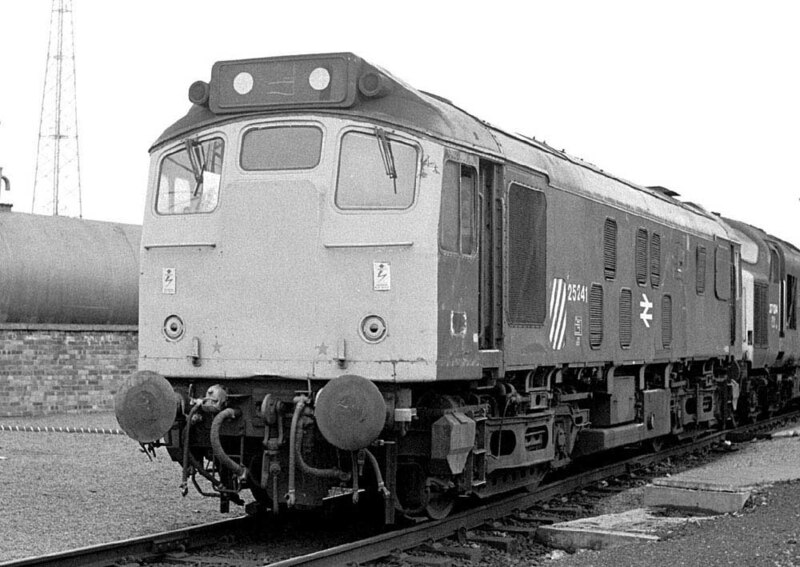 This was one Class 25 that did not linger long between withdrawl and scrapping. Noted Glasgow Works March - May 1976 (Classified & full repaint). When Banbury shed closed on October 3rd the passenger pilot at Banbury reverted to a Type 2, with D7591 initially used. After a short while the duty fell to the more common Class 08. On April 24th the 08.20 Edinburgh - Manchester Victoria was worked to Carstairs by 7591. Photograph collection of webmaster With the increasing use of dual-braked/airbraked stock in the 1960's several Class 25's received dual brake equipment in order to handle empy coaching stock movements at major terminals. 7591 was so equipped to handle the Craigentiny ECS duties and is seen here at Edinburgh Waverley on August 17th 1969. On March 26th a fire caused a power failure on the west side of Edinburgh Waverley, leading to many services using the suburban lines. The next day hand signalling at the west end was in place, but some services continued over the suburban lines to ease congestion. One such working was the 17.20 Edinburgh - Birmingham with 7580 & 7591. For reasons unknown 7580 was left at Slateford Yard which caused 7591 to struggle towards Carstairs, causing delays to itself and following trains. Photograph courtesy Bill Jamieson Its dual braking equipment allowed 7591 to handle workings somewhat different from its intended duties. Here on August 19th 1971 7591 heads the 4V73 Edinburgh - Pengam freightliner on the ECML somewhere between Penmanshiel & Granthouse. Condition August: green livery with full yellow cabfronts, no frame level stripe, gangway doors present, straight sided sandboxes, three-rung bogie mounted footsteps, no blanking plates, "D" prefix present. On August 23rd the 17.24 Edinburgh - Glasgow Central was worked by 7591. 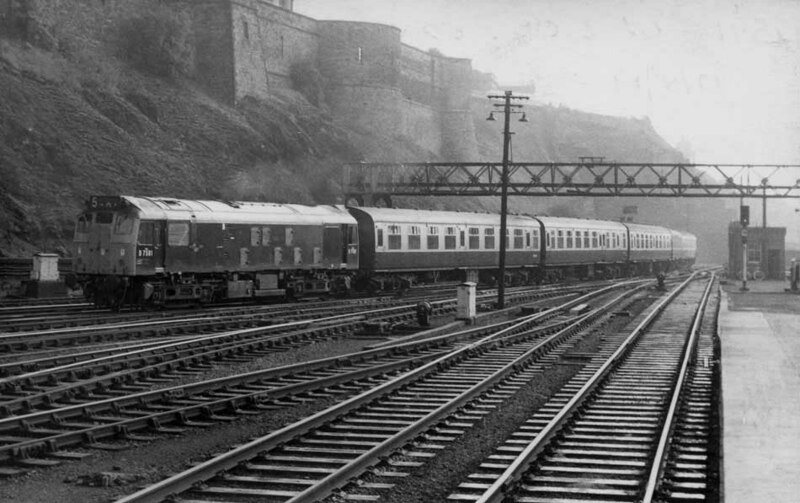 With the replacement of the Inter-City diesel multiple units on the Glasgow - Edinburgh service by the push-pull locomotive powered Mark II trainsets, there were times when the Class 25s substituted for the Class 27s. The first recorded instance occurred on October 13th when the 13.30 Glasgow Queen Street - Edinburgh push-pull service was worked by 7591 & 7578. On March 9th the 10.30 Glasgow Queen Street - Edinburgh push-pull service was worked by 7591 & 5404. On May 4th at least one Glasgow Queen Street - Edinburgh push-pull service was worked by 7591 & 5394. The 11.53 Carstairs - Edinburgh service was worked by 7591 on September 6th. On December 8th the 09.20 Edinburgh - Perth and the 19.42 Perth - Edinburgh were worked by 7591 & 5326. On December 11th 7591 & 5410 worked the 14.00 Edinburgh - Glasgow. The 17.05 Glasgow Queen Street - Aberdeen was worked by 25241 on May 7th. On October 20th the 11.34 Newcastle - Edinburgh was worked by 25241. On April 8th the 08.38 Glasgow Queen Street - Oban was banked to Cowlairs by 25241. The 23.45 Inverness - Glasgow Queen Street was worked by 25241 & 25227 on September 4th. On March 4th the 08.33 Edinburgh - Blackpool North mystery excursion was worked by 25241 & 25226 to Carstairs. The locomotives were then used on the Crewe - Kincardine LCGB 'Caledonian No.3' railtour. This tour had arrived from Crewe behind 85008, giving way to the Class 25s at Glasgow Central. The train headed south to Rutherglen, then heading off to Carmyle, Langloan (where the train was stoned by the locals), Coatbridge, Cumbernauld, Larbert & Stirling. The freight only line was taken to Alloa, a slow ride due to the gated crossings, then to Kincardine Junction and alongside the Firth of Forth, through Culross, Valleyfield, Charlestown Junction and to Dunfermline Lower. Then on to Townhill, Cowdenbeath station, Thornton, at Thornton West the spur to the Aberdeen - Edinburgh line was taken for Inverkeithing and the Forth Bridge, Falkirk and rejoining the outward route at Carmuirs. A window was broken by the locals in this area, which was boarded up at Glasgow Central. 25241 was noted shunting oil tanks at Eastfield depot on April 16th, the BIS side appeared to have lost much paint at the frame level. On August 14th 25241 was south of the border and worked the 17.45 Manchester Victoria - Blackpool North. Two days later (16th) the 11.30 Bangor - Manchester Victoria with 25241 failed at Chester, 25168 dragged everything to Manchester Victoria. The 'West Highlander No.4' railtour on September 29th from Liverpool to Mallaig was worked roundtrip Fort William - Mallaig by 25241 & 25078. The 23.50 Inverness - Edinburgh was worked by 25241 on October 2nd. On April 5th the 22.36 Cowlairs - Mossend Yard was worked by 25241, being a portion for the 1M15 20.35 Inverness - Euston. The 22.02 Carstairs - Edinburgh, being a portion off the 1S87 18.05 Birmingham - Glasgow was worked by 25241 on June 26th & 27th. On July 28th the 13.39 Dundee - Glasgow Queen Street was worked by 25241. 25241 was noted light engine northbound at Kingussie on August 11th. The 07.39 Dundee - Glasgow Queen Street was worked by 25241 on September 9th. On September 17th 25241 worked the 15.35 Glasgow Queen Street - Aberdeen. The 06.40 Glasgow Queen Street - Dundee and the 09.39 Dundee - Glasgow Queen Street was worked by 25241 on November 11th. On December 1st the 10.14 Perth - Motherwell was worked by 25241 & 25226. On March 7th the 18.44 Glasgow Queen Street - Dundee and the return working were worked by 25241. The 14.00 Glasgow Central - Carlisle was worked by 25241 on March 26th. On April 6th 25241 worked the 17.12 Perth - Arbroath and the 18.33 Arbroath - Dundee. Five days later on April 11th 25241 worked the 12.44 Glasgow Queen Street - Dundee and the 15.39 Dundee - Glasgow Queen Street, exiting the station by banking a departing service. 25241 was withdrawn on May 6th 1981. At the time of withdrawal 25241 would have been due major shopping, but Classified repairs for the Class 25s ended by the close of 1980. 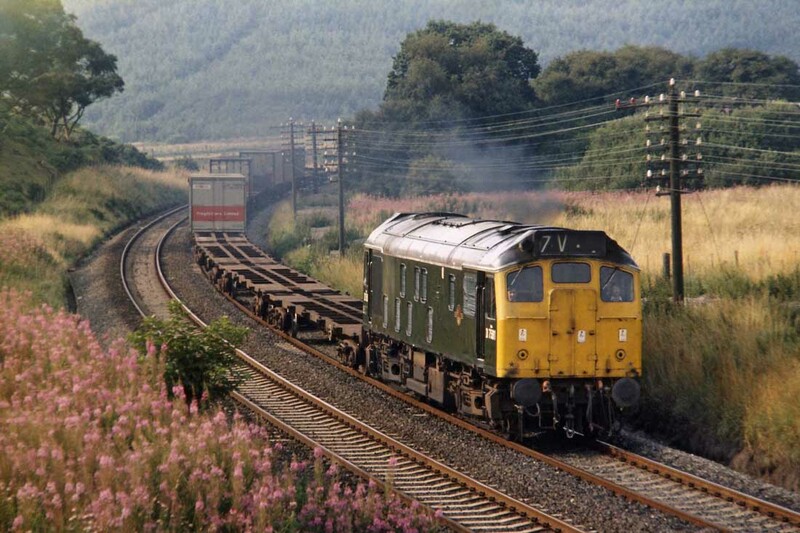 Photograph courtesy Tony Sayer Its June 13th 1981 and 25241 stands at Polmadie having been withdrawn for about a month. Interestingly the nearest filter grille has been replaced by a solid chevron covered 'plate'. A number of Scottish Type 2's had at least one filter aperture blanked off, but never this colourfully. Page added January 18th 2013.